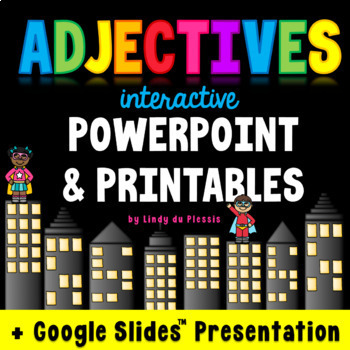 If your students enjoy bright colors, animation, and interactive activities, then you've found the perfect product to teach adjectives! 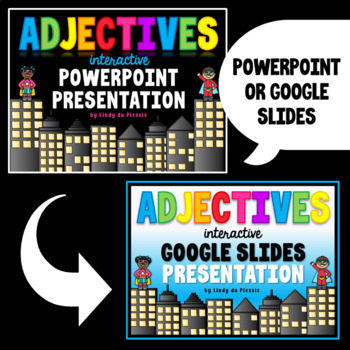 This is a highly visual and interactive PowerPoint that consists of 36 slides, jam-packed with engaging activities. 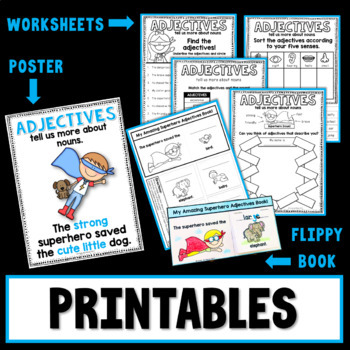 Six matching printables (worksheets, a flip book, and a poster) are included to reinforce and consolidate new grammar knowledge. 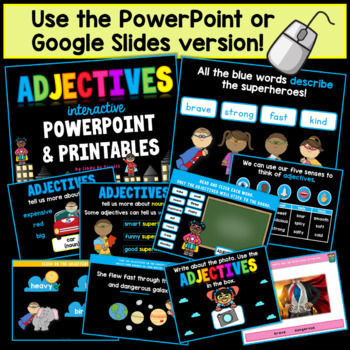 Use this pack for whole class teaching, literacy centers, test prep or review. The combination of colorful graphics, animation, a narrative storyline (superheroes), quiz-style informal assessment and use of personal whiteboards (or paper) create a learning experience that works! This set is incredibly versatile, use it for sub lessons or even for your formal observations. It's no-prep, click and teach. It will save you hours and hours of prep. Single classroom user license. Please do not share or place on the internet.